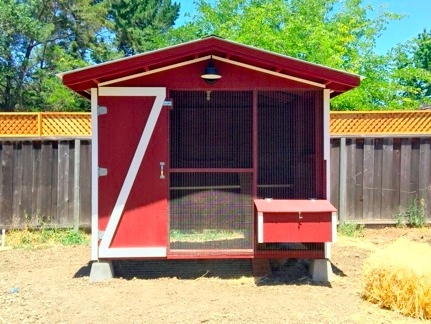 The Kiefer Sustainable Chicken Coop has demonstrated over the decades its unique value in providing a healthy, safe and productive life for chickens, while increasing the quality of life for families. It is my purpose to make the Kiefer Sustainable Chicken Coop and related practices available to the world. Hi! I’m ‘papa john’ Kiefer. Having lived in Lafayette, California for more than 50 years, I continue to enjoy the gifts of fresh eggs, while my rabbits and pigeons provide meat for the table. At 83, I developed this web site, with the help of my granddaughter, Angela, so that I could share some of my gifts with you. The Story of the Kiefer Sustainable Coop. In the early 1940’s, growing up in the country near Stanford University, California, with a French mother, grandmother, and a German father, our family included a variety of poultry, large vegetable garden, fruit orchard, and a vineyard for making wine. It was still a time of model T fords, out houses, and dirt roads. A joyous childhood was mine, as I internalized growing our own food, and living in balance with nature. The sustainable chicken environment that I grew up with, which my grandparents brought from France, had been used in Europe for centuries. In 1957-58, in my early twenties, I traveled overland thru 15 countries in Central and South America in search of the ‘Holy Grail’. A constant companion throughout my journey were the ubiquitous ‘jungle fowl’, otherwise called chickens, as they ran loose thru the villages and fields. Day to day I came to understand the life of this creature that plays such an important role in the nutritional health of humanity. Chickens taught me how, what and where they ate, exercised, slept, bathed, and laid eggs. Also, how important they are as a part of the family, and their special connection with children. They did not live in coops, and therefore there was not unpleasant odor, nor any cleaning required. Theirs is a ‘long term, healthy living environment’, which Webster defines as ‘sustainable’. Moving to Lafayette, California in 1966, enjoying raising our children, it was time to reintroduce chickens to our family, with rabbits and pigeons to follow. Now, was the time to develop a sustainable environment for my chickens that is appropriate to the limited space of residential living. Starting with all of the features of healthy living from my South America experience, adding a few concepts from an ecology professor, I incorporated all into a contained structure. Voila! The 1st Sustainable coop. The principles are straight forward, design is simple, and construction easy. The chickens are healthy, happy, productive and safe from all predators. Since 2010, John has been teaching chicken workshops to the public, as well as working with city officials to update poultry regulations of housing chickens in residential environments. You'll find a few of our past featured articles below.